Make this drink, thank me later. 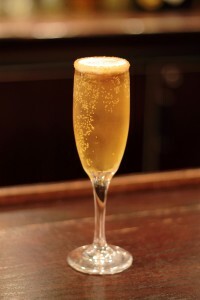 Morton’s Sparkling Cinnamon Apple Cocktail is pretty much the perfect drink to make on Thanksgiving. Or Christmas. Or Tuesday. I’ve actually never had it before, but I plan on changing that as soon as I motivate myself to go out and find some Monin Honey Syrup (fancy!). But I can tell just from the ingredients that I would love it. 2. Pour honey syrup, Prosecco and lambic into a shaker over ice. 3. Stir with spoon 10 times. 4. Strain into champagne flute. This entry was posted in You oughta know and tagged Carlie, Carlie Crash, drink recipe, holiday cocktails, Morton's sparkling cinnamon apple cocktail, sparkling wine by carlieblissirwin. Bookmark the permalink. I assume you are making this for me tomorrow night, right?